If you have been searching for rugged, dependable loading dock equipment in South Dakota, then you’ve come to the right place. Copperloy has been an industry leader for more than 60 years and everything we produce is proudly made in the USA. We have experience serving all types of industries and facilities, along with businesses of all shapes and sizes. Today, Copperloy is proud to be available to customers all across the United States. This includes a presence in South Dakota. Unlike many other manufacturers, you’ll find it convenient and accessible to receive our loading dock equipment. We also offer speedy, affordable shipping. No matter where you are in South Dakota, from Sioux Falls, to Rapid City, to Pierre, or any corner of the state, our equipment will get the job done for your business. 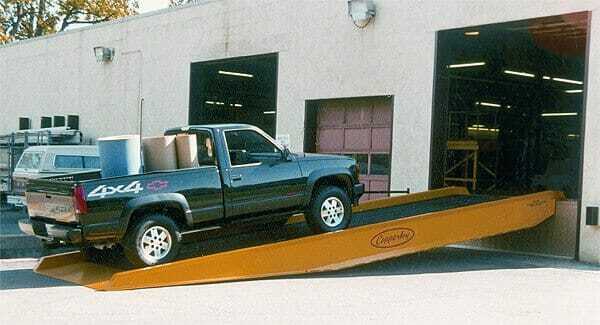 We produce a great selection of mobile yard ramps, dock-to-ground ramps, and forklift ramps. We also carry all other types of material handling equipment such as dock levelers, dockboards and rail boards, and dock lifts. Copperloy specialize in custom steel manufacturing, so there’s never any challenge too unique or problem too difficult. Copperloy and our expert team are here to get you the solution and equipment you need. Call our office at 800-321-4968 and we’ll be happy to answer your questions and help you get started with the leading yard ramps in South Dakota, Copperloy.